The real joy of late summer and early autumn cooking is waiting for the various berries and stone fruits to come into season. I just love plums, greengages and tangy fresh apricots (cooking apricots, rather than eating them raw, is quite the best way to serve them I think). You can make this with any stone fruit, and I’ve previously published recipes for apricot crumbles, tarts and cakes, but this simple and delicious chilled yoghurt sundae is hard to beat. A dash of French peach liqueur makes it good enough for a grown up dinner party dessert. 500g fresh apricots, stoned and quartered. Cook the apricots with the vanilla, lime juice and sugar over a gentle heat in a wide bottomed pan with a tablespoon of water. It will take about 15 minutes for the fruit to soften. I like the tartness of the apricots but add a little more sugar to taste if preferred. Allow the juices to evaporate and concentrate. Remove from the heat once cooked, pour into a bowl and allow to cool. Once it is sufficiently cool, chill properly in the fridge. I like the texture of the fruit with the skin but you can also pass this through a metal sieve to create a smooth and concentrated purée. This is also a good technique to use with damsons and small wild plums that are difficult to stone. Cook the fruit whole and then sieve. When you’re ready to serve, divide the fruit between 4 glass dishes. Pour a teaspoon of the Crème de Pêche liqueur over the fruit and allow to trickle through. 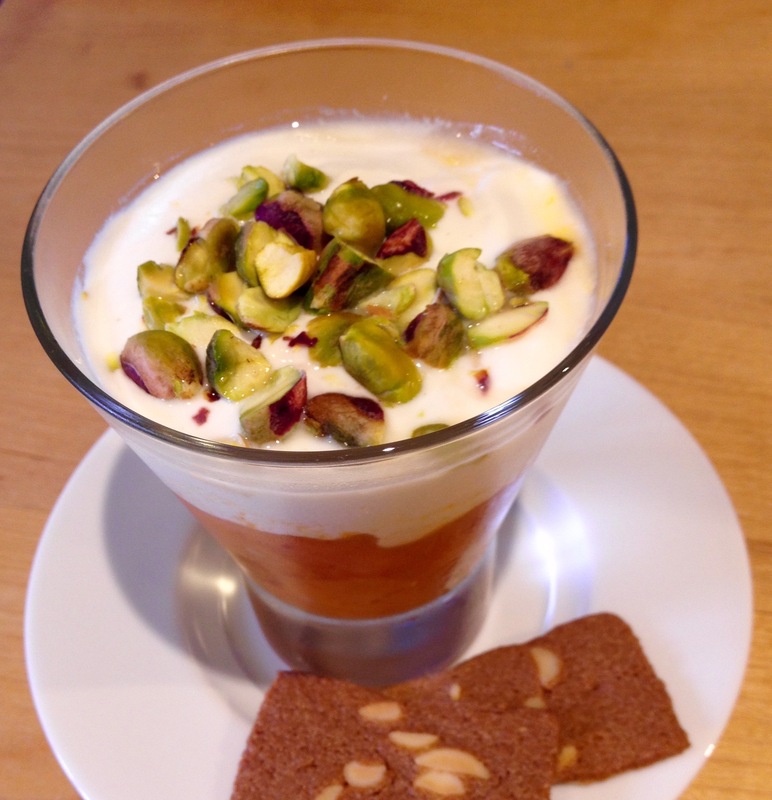 Top with the Greek yoghurt and pistachios. Serve with the almond tuiles. To make this with plums or damsons, add a little almond essence or sloe gin to the compote. Top with toasted almonds. Greengages perk up nicely with a little elderflower cordial. To make this with cherries, add a little kirsch to the compote. To make a fool, instead of using yoghurt, stir the fruit compote through with a mixture of 1/2 whipped cream and 1/2 custard. 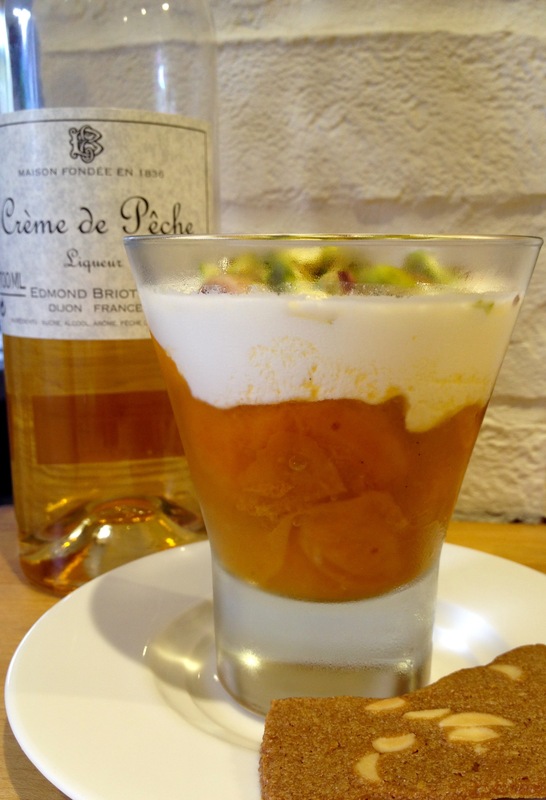 This entry was posted in Desserts, Recipes and tagged almond tuiles, apricot dessert, apricot fool, apricot yoghurt sundae, apricots, Crème de Pêche, Edmond Briottet, fresh apricots, fruit fool, Greek yoghurt, greengages, Lime juice, pistachio nuts, plums, stone fruits, toasted almonds. Bookmark the permalink.